It's been a weird spring season so far, with plenty of rain and air temperatures that go from hot to cold overnight, along with more than our fair share of windy days. Last weekend we fished up in the Catskills. When we arrived Friday at dusk, it was hot and humid, windless, and much like an early July evening. Saturday morning when we first got up, it was cool and calm, but in the short time in between grabbing breakfast and getting on the Beaverkill River, the wind kicked up and made casting very tough, and often impossible during the high gusts. The air was filled with caddis flying upstream with the wind, and the water surface had huge mats of floating caddis shucks that except for a sheen, looked much like oil slicks. Fish rose sporadically, and at the end of the day we did catch a few fish. This past weekend we fished Sunday on our local water, the South Branch of the Raritan River, and again the weather was very un-springlike. I headed down to the river mid-afternoon. The air was 48 degrees F, and as luck would have it, it started to rain just as I put on my waders. Not one to let a little precip stop me from fishing, I geared up and walked to the river. The water was clear, and the level perfect. Not a soul was in sight, which is unusual this time of the year, and likely was weather related. Over the next few hours the rain stopped and started several times, and as is often the case when it's raw, cloudy and rainy, little blue-winged olives hatched. 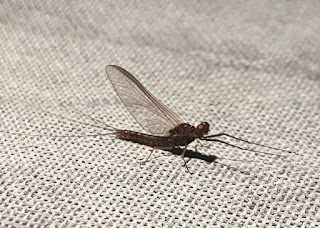 These little mayflies, size #22 or so, drifted unmolested by the trout on the brisk current, lifting off into the air casually - do you think the insects know when the trout are not interested? I saw one rise. I drifted a small soft hackle pheasant tail across and downstream, picking up a couple of stocked rainbows. It may have been cold and raw, but it was pleasant being on the river with only the birds and the sounds of raindrops accompanying me. Its fascinating how the swallows and purple martens fly over the water, drop down, and without slowing down pick off the little mayflies with just a quick tip of the head.